﻿ Hanuman Was A Dalit, Ram Temple Unnecessary! Hanuman Was A Dalit, Ram Temple Unnecessary! At a BJP Rally in Rajasthan last month, Uttar Pradesh CM Yogi Adityanath described Hanuman as a God who was a forest-dweller, lived in mountains and united Dalits who were deprived. 'Rajasthan Sarv Brahmin Mahasabha' served a legal notice to the Chief Minister for using Hanuman's Caste to get votes in Rajasthan. 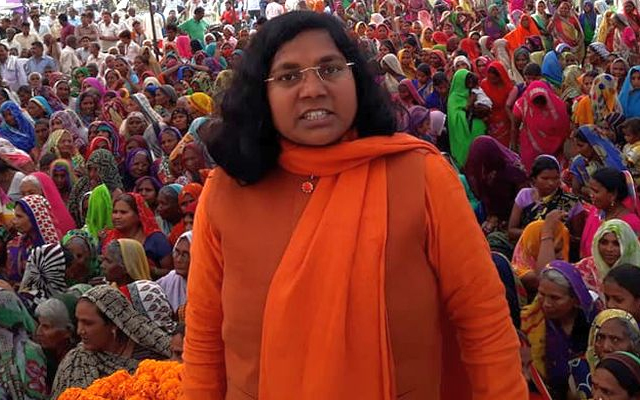 And now, BJP MP Savitri Bai Phule stirred a fresh controversy with her sensational comments. She opined Hanuman should have been made human for the service he has done to Lord Rama, instead of treating him like a Monkey. 'Hanuman faced humiliation because he was a Dalit. Why Dalits aren't treated as humans?,' he questioned. When asked about the Ram Temple, Phule made it clear that the country doesn't need a temple questioning whether it would end unemployment and other problems of Dalits. She didn't mind stating BJP is raking up the Ram Temple issue as it doesn't have anything to discuss in the Election Year. A BJP Spokesperson tried to downplay the comments made by the Party Lawmaker saying she doesn't have knowledge about the Indian Tradition.